Be the first to share your favorite memory, photo or story of Jolanta "Jolcha". This memorial page is dedicated for family, friends and future generations to celebrate the life of their loved one. 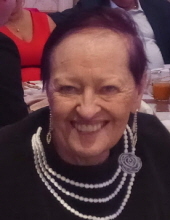 Jolanta “Jolcha” Kaczor nee Wrona, age 79, passed away peacefully around family at her Arizona home on March 30th. Jolcha was the beloved wife of Casimir “Casey” Kaczor Sr. for 57 years. They were inseparable till the end. A true love story. She was the loving mother of Mary Ann Kaczor and Casey (Ann) Kaczor Jr. Dearest daughter of the late Janina and Tadeusz Wrona, sister to the late Gregory Wrona and a wonderful grandmother to Jennifer, Chris and Michael Kaczor. Beloved aunt to nieces and nephews. Arriving from Warsaw, Poland at the age of 20 she made Chicago her home for most of her life, always lending a helping hand to family and friends. She found joy in volunteering, fundraising and being involved with the Tatry Ski Club where she was club secretary for 10 years. Jolcha had a zest for life and lived it to the fullest. Visitation Tuesday April 9th from 3:00 p.m. to 9:00 p.m. at Cumberland Chapels, 8300 W. Lawrence Ave., Norridge. Funeral services will begin at 8:30am on Wednesday April 10th at the funeral home and will then proceed to St. Stanislaus Bishop & Martyr Church for Mass at 10:00 am. Interment will follow at St. Adalbert Cemetery. Info: www.cumberlandchapels.com or call 708 456-8300. To send flowers or a remembrance gift to the family of Jolanta "Jolcha" Kaczor, please visit our Tribute Store. "Email Address" would like to share the life celebration of Jolanta "Jolcha" Kaczor. Click on the "link" to go to share a favorite memory or leave a condolence message for the family.